Devolver Digital puts out some pretty unconventional games by indie developers, it’s sort of like their thing. 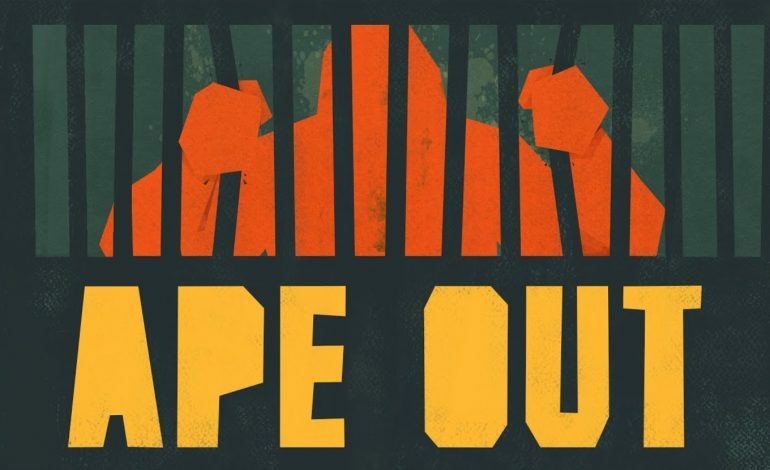 Ape Out, an upcoming top-down action game in the same vein as Hotline Miami, has been delayed. The game is produced by Gabe Cuzzillo, with music from Harmonix creative director Matt Boch and art from Bennett Foddy, who is probably best known from Getting Over It and QWOP. This team certainly isn’t monkeying around with this title. If this interests you and you’re frustrated because it’s been delayed, don’t worry. It was only moved back from February 7 to February 28. To go into some details about the game, the game has you play an ape, as implied by the title, breaking out, also indicated by the title. According to the game’s Steam page, players will have to find their “procedurally generated path to freedom”. Crushing enemies with ape strength, using them as human shields, and more, players will have to use everything at their disposal to escape. With striking visuals and dynamic jazz music tied to the gameplay, the artistic elements of the game go hand in hand with the extreme violence. On the topic of violence, if you’re a fan of weirder projects and like things that are vaguely tied to Devolver Digital, it seems that Pekken is going to become a reality. Not only that but, it’s also going to be published by Devolver Digital (though they are humorous, they’re probably not joking). Pekken is a fighting game being developed by Jon McKellan. What makes this fighting game unique? Pigeons. It’s a fighting game about pigeons. This is quite a unique pitch, so hopefully it won’t ruffle anyone’s feathers. It seems like Devolver Digital likes publishing games about animals. If you’re interested in the full story on Pekken, you can read it here. Ape Out releases for PC and Nintendo Switch on February 28.